Edward J. German, the youngest of the eleven children of Frank and Elizabeth German, was born on May 4, 1893 in the St. Mary Community near Humphrey, Nebraska. 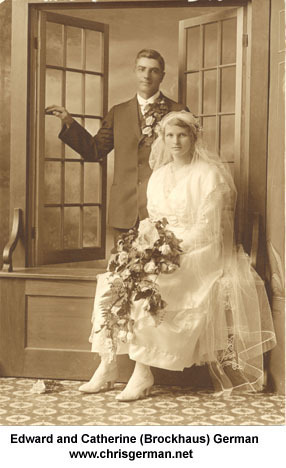 He married Catherine Brockhaus on April 17, 1917 in St. Francis Church, Humphrey, Nebraska. Catherine was born on August 2, 1894 near Humphrey, Nebraska, the daughter of Joseph Brockhaus and Josephine Fangmann. Edward and Catherine at first started to farm near St. Mary Church outside of Humphrey. In 1921 they moved to White Rock, South Dakota where they farmed until 1934. In that year they moved to Hankinson, North Dakota, where they farmed until the fall of 1959. Then they purchased a house in Hankinson and retired. In 1979 Ed and Catherine became residents of a nursing home. On Easter Sunday, April 17, 1982 they celebrated their 65th wedding anniversary. Edward died August 17, 1982, and Catherine on June 20, 1992. Both are buried at Calvary Cemetery, Hankinson, ND. Edward and Catherine had eleven children. Five of their sons served in the armed forces.